Every February the questions start rolling in, "When is the GeriPal-Pallimed party?" Just so you know and can mark it on your calendars from here to eternity, it has a standing reserved spot on Thursday night at 9pm local time the week of the Annual Assemblies of the American Academy of Hospice and Palliative Medicine (AAHPM), the Hospice and Palliative Nurses Association (HPNA), and the Social Work Hospice & Palliative Care Network (SWHPN) (but just to be clear it is not an official part of either the meeting). And as always, feel free to invite and bring any colleagues or new friends with you as this is not an exclusive crowd. So for 2018, that means you should clear off the evening of March 15th. We will, of course, be doing our traditional pub crawl starting at Sonsie at 9pm. Around 10pm we will likely be moving on to the next destination. Like always though, these are rough estimates of time, so if you want to know the details, follow the hashtag #HPMparty on Twitter. You can also find information and people talking before, during and after the event on the Facebook Event page. And new this year, we are adding an event! 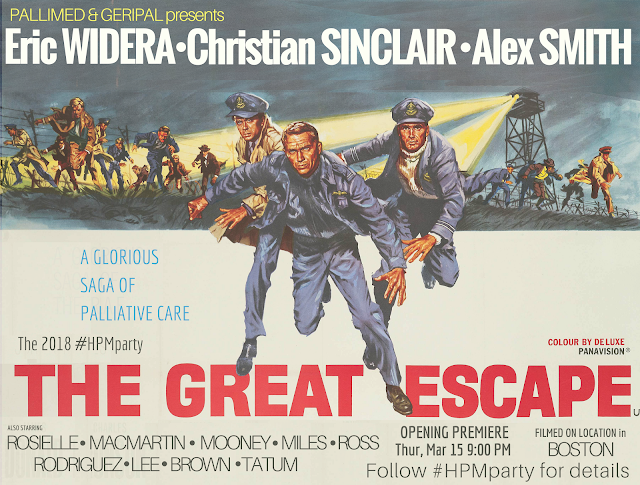 Get ready for the first ever #HPMparty Escape Room! We are partnering with Escape the Room Boston to reserve three different themed rooms over five time slots from 7:20 to 9:40. (We can open up a later one if the demand is high!) You can always join up with the pub crawl before or after (or not at all, if that is not your thing!). No need to buy anything or sign up for anything if you are just doing the pub crawl. ESCAPE ROOM DETAILS: Each room holds 8-12 guests where you will work together solving puzzles and clues with excellent communication skills (honed as excellent hospice and palliative care clinicians of course). It will cost $30 per person and we only have around 60 slots, so sign up soon! All of the Escape Rooms are reserved exclusively for us, so you will be working with fellow clinicians and not somebody on their first date...awkward! You will want to get to the Escape room 15 minutes ahead of your scheduled time and it takes 15 minutes by car and 20 minutes by train. Be on time! Once your room starts you will be there no longer than 70 minutes (60 to finish the room and 10 to wrap up). If you are good you’ll be done early! Example: Reserve the 9:00pm time slot. Leave for Escape the Room Boston at 830 to get there by 845. Do the Escape room at 9p and be done at 10p, take pics and leave! And if you are not already doing it - Follow Pallimed on Facebook, Twitter and Instagram and Follow GeriPal on Facebook, Twitter and your favorite podcasting app. This is a gorgeous place, and I won't soon forget it. Attended an event here sponsored by the company. The reception hour was held in one of the rooms next to the home studios NYC. I loved their buttery mashed sweet potato.